Is your hotel located near Lyric Theatre? Get in touch now to be listed on this page. 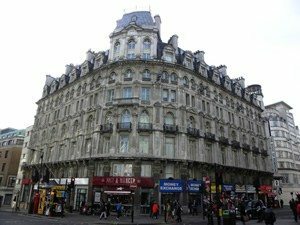 The Victorian architecture of Thistle Piccadilly Hotel matches that of its surroundings, making Coventry Street one of the most aesthetically pleasing in London. Situated within a stones throw of all of London’s main attractions, including Theatreland, the Thistle Piccadilly Hotel is an ideal choice for tourists visiting the city. The hotel itself has a comfortable lounge and bar, access to a Heath and Fitness Centre and the rooms themselves go above and beyond with their available facilities. For example, each room has tea/coffee facilities, complimentary water and chocolates, complimentary newspapers and magazines, a flat screen TV with Freeview, bathrobes and slippers, king sized beds and a mini fridge. Call 0800 330 8395 for reservations and further information. Reviewers on TripAdvisor have given Thistle Piccadilly Hotel 4.5 out of 5 stars. Nestled among the stretch of theatres on Shaftesbury Avenue is The Piccadilly by Montcalm. 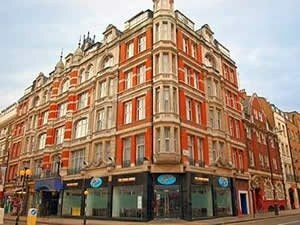 Location wise, this hotel could not be better for those looking to enjoy West End theatre and for those who wish to stay somewhere central in London. The hotel is filled with multilingual staff and has a 24 hour reception and Concierge service. Hotel amenities include a private lounge with refreshments, a restaurant and bar as well as a Fitness Room exclusively for guests. Rooms are fully equipped with free internet access, air conditioning, tea/coffee-making facilities, a satellite TV, fresh flowers, complimentary toiletries and some rooms even have a bathroom television. Call 020 7871 6000 for reservations and further information. Reviewers on TripAdvisor have given The Piccadilly by Montcalm 5 out of 5 stars.